JANUARY 15--According to a new report, music stars like 50 Cent and Mary J. Blige have been juicing, a la top athletes like Marion Jones, Andy Pettitte, and, allegedly, Roger Clemens. 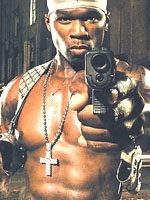 50 Cent (real name: Curtis Jackson) and Blige reportedly used aliases when having performance-enhancing drugs shipped to them (50 was 'Michael Jordan' and Blige posed as 'Marlo Stanfield,' the handle of a character on HBO's 'The Wire'). While 50 Cent has not commented on the steroids report, concert tour documents confirm that the star has indeed used the Jordan alias. The rapper's hotel rider, an excerpt of which you'll find here, shows that the 32-year-old performer used the name 'M. Jordan' when checking into luxury lodgings.